To the surprise of no-one, Bruce Boudreau already has a job. He’s been hired as the new coach of the Minnesota Wild, replacing interim coach John Torchetti in the post. 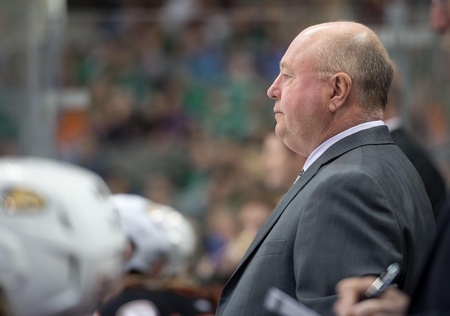 Boudreau was fired by the Anaheim Ducks on April 29 after the team failed to advance in the post-season and lost a fourth straight Game Seven. Despite leading the club to the Pacific Division in each of the past four seasons, the coach was sent on his merry way with a year to go on his contract. The Ducks apparently gave Boudreau permission to talk with the Wild and the Ottawa Senators and obviously the former won out. Boudreau reportedly signed a four-year deal with the Wild worth $2.76 million. Apparently Minnesota added some more money to their offer after learning he was speaking to the Senators. The Toronto-born 61-year-old has an impressive coaching legacy, at least in the regular season. He was named interim head coach of the Washington Capitals in November of 2007 and put together a 37-17-7 rookie coaching record after the team was 6-14-1 prior to his hiring. The 2007-2008 Capitals won the Southeast Division, their first in seven years, and made the playoffs for the first time in five years. In 2008, Boudreau was awarded the Jack Adams Award. Under Boudreau, the Capitals went from a non-threat in the Eastern Conference to a perennial powerhouse in the regular season. The team won its first President’s Trophy in his third season behind the bench. Unfortunately, limited playoff success and a bad start to the 2011-2012 season saw Boudreau fired by Washington. He left the club with a 201-88-49 record in the regular season, but he was 17-20 in the post-season. The Ducks hired him just two days later as the replacement for the ousted Randy Carlyle. While Anaheim missed the playoffs in the 2011-2012 season and finished fifth in their division, the following years saw a sea change under Boudreau. After four division titles and a regular season record of 208-104-40, the disappointing 24-20 playoff record was enough to sink him in California. In Boudreau, Minnesota gets a coach with an offensive-minded approach and a clear identity. Chuck Fletcher’s team is in need of both factors, so this big-name hire could actually be a good thing. And if Boudreau can get the likes of Zach Parise, Mikko Koivu and Charlie Coyle clicking along at an Anaheim-like scoring pace, the Wild could get a pretty good boost from their new man.